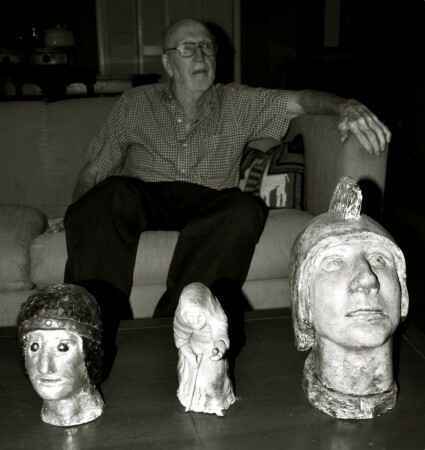 Out Wire Road, past the vet school, soccer fields and trailer parks lives a literary giant. A distinctly Southern writer whose book, “An Exile,” became a movie starring Gregory Peck. Someone who was pen pals with Flannery O’Connor. Someone whom former Poet Laureate James Dickey called “the greatest writer of his generation.” Someone who has books written about him. His name is Madison Jones. He is 84. 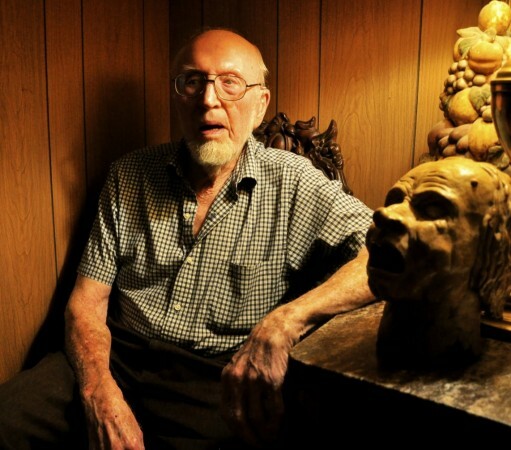 He has lived in Auburn for 53 years. A few weeks ago, on a Friday afternoon, I drove out to meet him. “Is that Mr. Jones?” I ask. “Yep, this is Madison Jones,” the son answers, pride in his voice. The Joneses shuffle toward the garage door. I follow. So does Madison Jones’ dog who they just rescued from the pound. “We thought she’d crawled off into the woods and died,” the son says. I respond with a “Glad she didn’t” or a “That’d been a shame” and follow the elder Jones into the living room. He sits on the couch. I’d been warned he didn’t hear well. I join him there. He is wearing a green plaid shirt and dark blue pants. His shirt pocket holds several pieces of paper and an empty case for his glasses. His glasses rest on his nose. A white beard frames his jaw. The walls are wood paneling and the carpet is a hue of red somewhere between blood and maroon. Sitting on various tables is an audience of clay and plaster heads. There is a Sitch. She’s sandwiched between the Zephyr and the Roman Soldier. She looks at me down her crooked nose. She cackles. Since my interview experience consists of bar pickup attempts and awkward questions to fashion majors at a speech I covered for class, I start with something I know — Auburn football. 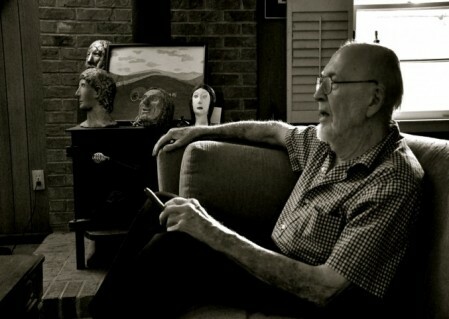 Jones moved to Auburn in 1956 to take a job teaching creative writing at the university. Naturally I ask him about the 1957 team. I shift to writing and to the agrarian movement and to Faulkner — stuff Madison Jones actually wants to talk about. When Jones was a younger man, he thought he wanted to be a farmer. He even took a year and a half off from college to farm. During that year, he tilled and planted and learned the importance of words like “hard” and “work” at his father’s farm 25 miles north of Nashville in tiny Ashland City. Published in 1957, that first novel, “The Innocent,” attracted the attention of Flannery O’Connor. That Flannery O’Connor. She sent him a letter praising his work. “He’s so much better than the ones all the shouting is about,” that O’Connor once wrote. The two became friends and Jones went to see her at her farm before she died. An Auburn professor who knows Jones told me that O’Connor gave him a peacock from her farm. Jones doesn’t tell me this, and I don’t see any peacocks, but it seems plausible. He seems like a man who would keep peacocks. Pre-peacock Jones received a bachelor’s degree from Vanderbilt where he studied under poet and leader of the Southern Agrarians, Donald Davidson. Davidson was also a member of the Vanderbilt Fugitives, which later launched the career of Robert Penn Warren among others. After Jones graduated from Vanderbilt, he went on to get his master’s degree from the University of Florida where he studied under Andrew Lytle, a giant of the agrarian movement in his own right. Jones says one of the main reasons he got into writing was the encouragement of Davidson and Lytle. Their influence is evident in his writing. So is the life he has lived in the South. Jones worked at Auburn from 1956 to 1987. For part of his tenure, he was a university writer-in-residence. He taught everything from classic literature to poetry to freshmen English to creative writing. He has written 11 novels and two nonfiction books. His most recent book, “The Adventures of Douglass Bragg,” was published last fall. He says it will be his last. One of his books, 1967’s “An Exile,” was turned into a movie. It starred Gregory Peck and Tuesday Weld and was renamed “I Walk the Line.” Johnny Cash did the soundtrack. The movie released in 1970 to decent reviews. That they weren’t stellar? Jones blames the director for going on vacation during editing. We talk for a good bit about his various books. At the time, I had only read part of his novel “Last Things.” I tell him that. He says it isn’t a good example of his work and that I should read “Nashville 1864” — a book loosely based on his father’s experiences growing up during the Civil War. I tell him I will. We talk about his childhood. He was raised in a strict Presbyterian home. His father didn’t spare the rod, he says with this wry smile on his face. We talk about his influences. He mentions the Bible. Sitting on a table to my left is Jones’ clay interpretation of Jesus. Maybe it’s a trick of light, but the face seems to be glowing. He talks about how society’s morals have shifted. 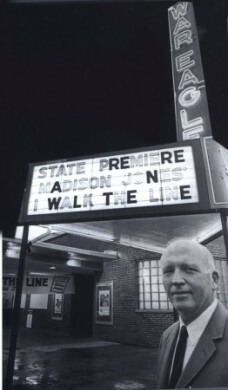 Dan Lattimore, an English professor at Auburn and a former colleague of Jones, and Judy Troy, Auburn University writer-in-residence and creative writing teacher, both had several “Madison Jones stories” to tell. Lattimore told me of a party he and Jones both attended at a mutual friend’s house. Adult beverages were present. At the end of the night, the friend, decided to drive home. As things happen, he was pulled over and arrested. Jones, angry that his friend was being held in prison, went to spring him. He was arrested and had to be bailed out himself. Hoping to one day consider myself a writer, I ask Jones some writing advice. We both give a little laugh. 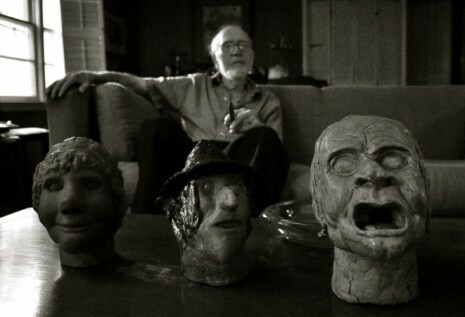 He takes a long look around the room, his gaze falling on several of his clay sculptures. “No, I don’t think I am going to write anymore,” he says mostly to himself. The silver-faced Queen of Sheba looks sad. ‘I Walk the Line’ premiere photo via AU Archives. wonder what he would think of blogging as writing. I read “A Cry of Absence” while I was at Auburn. It’s a beautiful book. I picked up “An Exile” because I first saw “I Walk the Line.” Within a few minutes of reading the opening paragraphs, I was struck by what a delicate hand Jones had with his prose. Deceptively simple…but you find yourself going back and re-reading lines and paragraphs, realizing how much he’s getting across. Complex writer.